Announcing the winners of the 23rd ever Right Place Photo Caption Contest! Presenting the top "twelf" captions for this picture from REUTERS/Seth Wenig via Yahoo! #12: "It's dead in here! Where are the ho-ho-ho's?" #11: Just fired by the store manager, Earl thought to himself: "What friggin' Santa says, 'Happy Holidays'? Crap! I'm a casualty of the War on Christmas." #10: "No, really... watch! Every time a bell rings, Santa takes another slug of whiskey!" 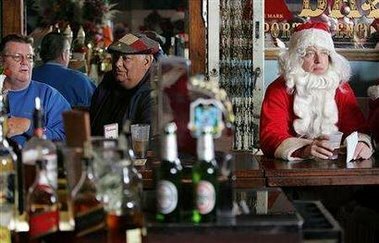 #9: Santa realized he was running low on drinkin' money, so he sold the list of bad girls for $100. #8: After the "Missing Toy Fiasco of 1912", Santa always made Ireland his last stop of the night. #7: Local police go undercover to nab underage drinkers. #6: Guy on left: "So then, this twelve-pointer appeared right in front of me -- almost like he had just come down out of the sky! Naturally, I took him down in one shot. We had to paint over that red nose, but we finally got him mounted and hung over the fireplace, just in time for the holidays." #5: Santa felt a twinge of guilt for letting the bar patrons toss his Elves, but the little buggers deserved it for what they did to Prancer, Dancer and Vixen. #4: "Rudolph is sick, so Santa is working on his own red nose." #3: "It's been like this every Christmas for the last 5 years. After visiting 15 Old House Lane, he comes in here muttering something about ponies, midgets, and the low quality of cigars left for him." #2: "'You'll love the job,' my high school guidance counselor said. 'See the world,' she said. 'Bring joy to millions of children!' Yeah, but she didn't say anything about the price of reindeer feed, and just let HER try to get the members of Elves Local 197 to clean out the stables! And can I step out in a nice, pin-striped, double-breasted suit? Noooooo, I gotta wear a red pup tent and a funnel-shaped hat! And no Grecian Formula for you, Mr. Claus! Geez, I hate retail!" #1: Santa's drinking problem was traced to that fateful night he went down the chimney at Nancy Pelosi's house and found her waiting by the fireplace in a see-through teddy.